Life gets busy. We all have the best of intentions, but it’s easy to become overwhelmed. Growing in your faith and deepening your relationship with God is the best way out of overwhelm, but where do you start? 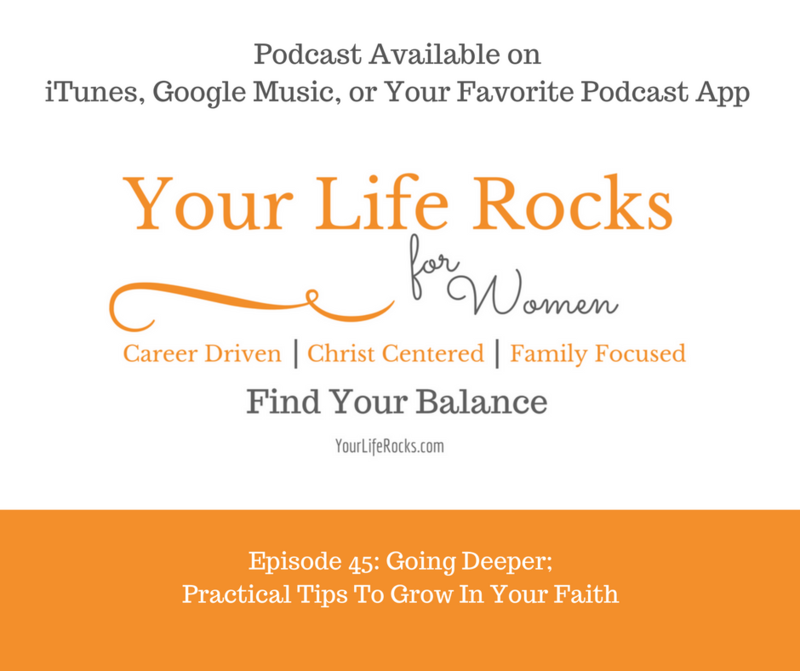 In this episode, we talk about going deeper. Learn practical tips to grow in your faith. I even through in some ways to fit in into your busy schedule. As a working mom, you have so much on your plate! I guarantee it will be worth it. There are some methods that you can put use to help you take your faith to a deeper level. Listen to sermons, podcasts, Christian music. Ring finger- Reading the Word. Try to find time each day to read your bible. Spending just a few minutes each day will help you grow in big ways. I struggled with this one because it felt so “religious” and not relational. I soon learned it paid to be able to refer to scripture when I was comforting a friend or fighting lies that I told myself. This one supports all the others. Spending time reflecting on what you heard, read, studied and memorize can take the Word of God to a whole nother level. It always God to speak to you on what you are learning. 2. While you are studying, there is a great method to help you take your studying deeper. The S.O.A.P method. Observation What did you observe from the text? Application How can you apply what you are studying? Prayer Pray about the application of this scripture. 3. Growing in any area of your life can take time and intention. Growing in your faith is no different. It is recommended to make time for God in the morning. After all, God asks for our first and best. Time is the new economy….it’s value is greater that money. Need help with finding a morning routine that works for you? I have you covered! Click here to get my guide to creating a solid morning routine PLUS get a template for my prayer journal.